On 13 December 2006 the United Nations Convention on the Rights of Person with Disabilities (UNCRPD) and its Optional Protocol (A/RES/61/106) was adopted at the United Nations Headquarters in New York, opening for signature on 30 March 2007 and finally entering into force on 3 May 2008, becoming international law. While there are basic human rights that apply to everybody, the UNCRPD focuses on ensuring that everybody recognises that these rights also apply to people with disabilities. Intended as a human rights instrument with an explicit, social development dimension, the UNCRPD "adopts a broad categorization of persons with disabilities and reaffirms that all persons with all types of disabilities must enjoy all human rights and fundamental freedoms, clarifying how all categories of rights apply to persons with disabilities and identifies areas where adaptations have to be made for persons with disabilities to effectively exercise their rights and areas where their rights have been violated, and where protection of rights must be reinforced". Its overall purpose is to “promote, protect, and ensure the full and equal enjoyment of all human rights and fundamental freedoms by people with disabilities and to promote respect for their inherent dignity”. Disability has increasingly been recognised as both a human rights and development issue following the entry into force of the UNCRPD, with an increasing body of evidence highlighting that people with a disability experience worse socioeconomic outcomes and poverty than persons without disabilities. The UNCRPD advances disability reform legally through direct involvement of people with disabilities through use of a human rights framework. Its core message is that people with disabilities should not be considered “objects” to be managed, but “subjects” deserving of equal respect and enjoyment of human rights. Despite this recognition scientific information and global awareness of disability continued to be limited, with no agreement on definitions of disability and little internationally comparable information on the incidence, distribution and trends of disability albeit a few documents outlining how individual countries have responded to and developed policies in relation to people with a disability. In response to this situation, the World Health Assembly (resolution 58.23 on “Disability, including Prevention, Management and Rehabilitation”) requested the production of a World Report on Disability based on the best available scientific evidence, which was then produced by the World Health Organization (WHO) in partnership with the World Bank, as previous experience has shown the benefit of collaboration between agencies for increasing awareness, political will and action across sectors. To find out more detail about the United Nations Convention on the Rights of Persons with Disabilities (UNCRPD) click here or to access the United Nations Convention on the Rights of Persons with Disability in it's entirety, click here. To provide governments and civil society with a comprehensive description of the importance of disability and an analysis of the responses provided, based on the best available scientific information. 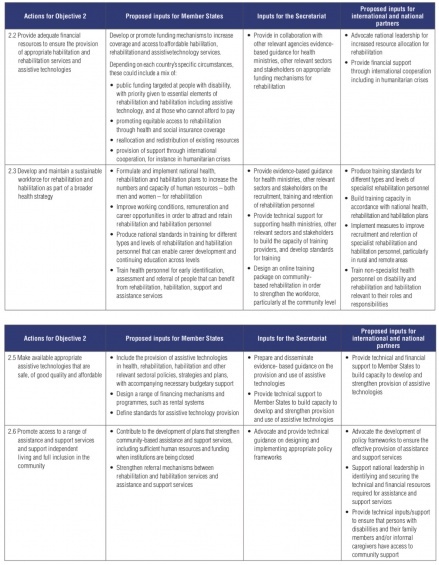 Based on this analysis, to make recommendations for action at national and international levels. To read a summary of World Report on Disability click here or to access World Report on Disability in it's entirety, click here. 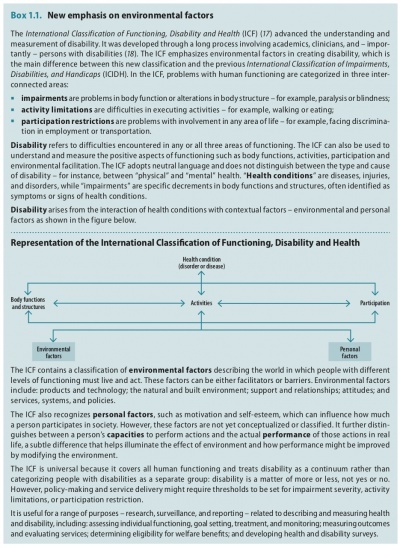 To read more detail about the International Classification of Functioning, Disability and Health click here or to access the International Classification of Functioning, Disability and Health in it's entirety, click here. Endorsed by World Health Organisation Member States in 2014, the Global Disability Action Plan 2014-2021; Better Health for People with Disability was a significant step towards achieving health and well-being and human rights for people with disabilities, supporting the implementation of measures that are designed to meet the rights of persons with disabilities, as enshrined in the UNCRPD. To read the WHO Global Disability Action Plan 2014 - 2021 in it's entirety click here or to access frequently asked questions on the WHO Global Disability Action Plan 2014 - 2021 click here. It is estimated that there are 65 million people globally who would benefit from a wheelchair but currently up to 20 million of these people do not have access to them. The prevalence of wheelchair use is rising, in part due to the aging of the population. Of the wheelchairs in use in highly developed parts of the world, about 70% are manual wheelchairs, with the remainder divided about equally between powered wheelchairs and scooters. Both the United Nations and the World Health Organisation recognizes and acknowledges that poor access to assistive technology including wheelchairs is a critical problem that needs to be addressed. Educate family members to support wheelchair users to be as independent as they can be. Objective 2 of Global Disability Action Plan 2014 - 2021 aims to strengthen and extend rehabilitation, habilitation, assistive technology, assistance and support services, and community-based rehabilitation. Independent mobility and access to assistive technology makes it possible for people to study, work, participate in cultural life and access health care. Without wheelchairs, people may be confined to their homes and unable to live a full and inclusive life. It is a vicious circle: lacking personal mobility aids, people with disabilities cannot leave the poverty trap. They are more likely to develop secondary complications and become more disabled, and poorer still. If they are children they will be unable to access the educational opportunities available to them, and without an education they will be unable to find employment when they grow up and will be driven even more deeply into poverty. Right to participate in cultural life, recreation, leisure and sport (Article 30). Disability is not only a public health issue, but also a human rights and development issue. WHO’s efforts to support Member States to address disability are guided by the overarching principles and approaches reflected in the WHO Global Disability Action Plan 2014-2021, the World Report on Disability, and the United Nations Convention on the Rights of Persons with Disabilities (UNCRPD). While many countries have started taking action to improve the lives of people with disabilities, much remains to be done. The evidence in the World Report on Disability suggests that many of the barriers people with disabilities face are avoidable and that disadvantages associated with disability can be overcome. The report calls on governments to review and revise existing legislation and policies for consistency with the United Nations Convention on the Rights of Persons with Disabilities (CRPD) and to develop national disability strategies and action plans. Access to good quality and affordable assistive products has been mandated by the Convention on the Rights of Persons with Disabilities (CRPD) for ten years but still only 10% of people in need of assistive products have access to them. If this urgent need is not addressed, the percentage of people with access will decrease, as demand increases and access to services remains stagnant. The need is acute everywhere, especially in low-and middle-income countries. ↑ The International Classification of Functioning. Disability and Health. Geneva, World Health Organization, 2001. ↑ Bickenbach J. The World Report on Disability. Disability & Society. 2011 Aug 1;26(5):655-8. ↑ World Health Organisation. 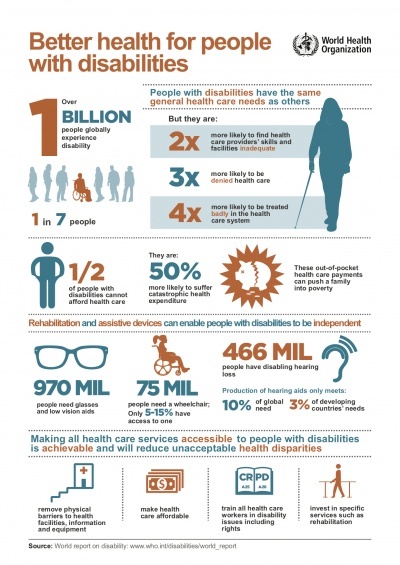 Better Health for People with Disabilities: Infographic. http://www.who.int/disabilities/infographic/en/ (accessed 2 June 2018). ↑ 11.0 11.1 William Armstrong, Johan Borg, Marc Krizack, Alida Lindsley, Kylie Mines, Jon Pearlman, Kim Reisinger, Sarah Sheldon. Guidelines on the Provision of Manual Wheelchairs in Less Resourced Settings. World Health Organization; Geneva: 2008. ↑ Tebbutt E, Brodmann R, Borg J, MacLachlan M, Khasnabis C, Horvath R. Assistive Products and the Sustainable Development Goals (SDGs). Globalization and Health. 2016 Dec;12(1):79.